There is a change afoot. It was subtle at first. A hazelnut macchiato here, an almond milk cappuccino there. We began seeing warehouse fit outs, blatantly exposing what lies beneath the surface to achieve a raw, edgy style. Industrial lighting with exposed bulbs began highlighting shabby chic furniture. Recycled bowling alley floors have been converted to counter tops where gluten free granola cups hold their own against the humble toastie. Phrases such as “funky social atmosphere” and “artisan patisserie” pop from rustic themed menus and white washed boards. “Brunch”, that dead space between breakfast and lunch when you’re not quite sure exactly what time it is other than it’s probably too late for bacon and eggs but too early for a sandwich and a coke, is suddenly a real concept where you eat things like “smashed avocado on rye” and “salmon and feta corn fritters”. Communal dining has become a thing that you come together over to indulge and collaborate, with share platters delivered to the recycled timber table on a bespoke metal stand. And you can order a milkshake in a jar. With a chocolate wafer stick and drizzled in honey. Yes people, the café culture has infiltrated the Top End. 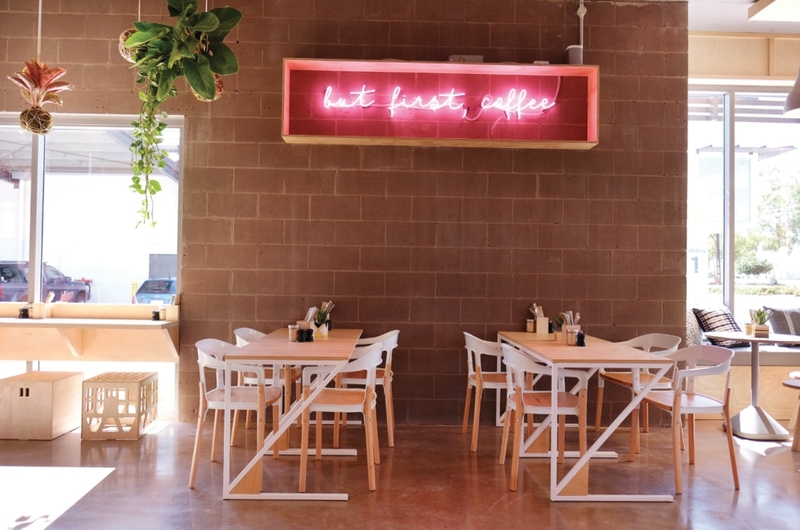 From the CBD to the suburbs, venues have been popping up all over the city, reflecting the style and sophistication of southern counterparts, and all offering hand crafted menus that rival the finest Parisian cafés. No longer is Darwin the country cousin of the more sophisticated city dwellers. We are now in the big league. But don’t worry…you can still get a bacon and egg sanga. It may just come on organic sourdough.